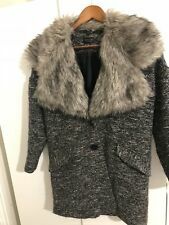 Save topshop grey pea coat to get e-mail alerts and updates on your eBay Feed. Unfollow topshop grey pea coat to stop getting updates on your eBay feed. RARE Burberry Prorsum A/W 11/12 Grey Mens Military Wool Pea Coat. Medium. 38. Debenhams Mens XXL Pea Coat Wool Grey Double Breasted Chest 48"-51"
Men’s H&M Peacocks Charcoal Grey Pea Coat Overcoat Sized Medium. Bargain! This page was last updated: 25-Apr 05:04. Number of bids and bid amounts may be slightly out of date. See each listing for international postage options and costs.